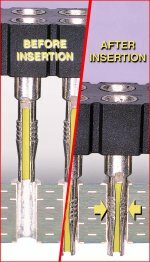 Compliant pin technology, also known as "press-fit", is a solder-free process used to apply interconnecting pins and sockets to a PCB. The mechanical and electrical interfaces between the product and PCB are made by a spring-like-compliant section and a plated through-hole. 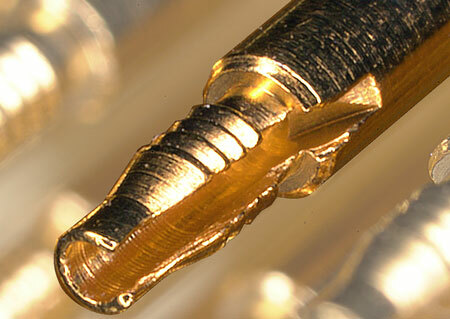 Mill-Max has developed a unique compliant pin design that is characterized by a hollow and slotted tail that closes down and conforms to the size of the plated-through-hole thus preventing damage. In addition, the combination of slotted tail and a series of fine serrations make a reliable gas-tight connection with the tin plating inside the hole. Mill-Max compliant tail sockets are available in dual-in-line (DIP) packages from 6 to 40 pins, as well as single and double row strips from 2 to 64 pins. All Mill-Max sockets use highly reliable six-finger inner contacts that accept .030" diameter round pins as well as .025" square pins. Compliant tail sockets are often used for stacking multi-layer boards with a variety of pin headers with a press-fit tail. Both compliant tail sockets and interconnects are available in two tail lengths, one for .060" - .100" thick panels and another for .090" - .130" thick panels.